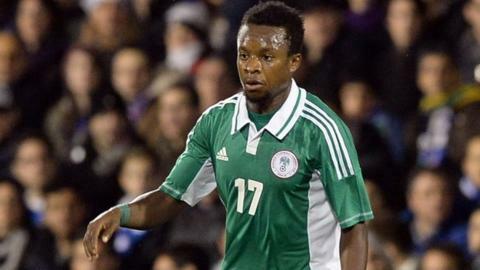 Nigeria international Ogenyi Onazi says he feels fortunate to be alive after he narrowly avoided last week's bombings in the Nigerian city of Jos. The blasts at a crowded bus terminal and market killed at least 118 people. Onazi, 21, who was born in Jos, had just left the popular Jos Main Market last Tuesday, when the first blast rocked the area. The midfielder, who plays for Italian Serie A side Lazio, said: "I am very, very lucky, just by the grace of God." Onazi is now with the Nigeria squad in London as they prepare for Wednesday's friendly against Scotland and he says he has been struggling to erase the memories of that dark day. Recounting his lucky escape, he told BBC Sport: "It was just like an ordinary day. Happy faces and friendly warmth that makes you feel happy to be back home. "We had gone to the railway market to get something. I think it was 15 minutes later when we heard the loud blast from the place. And suddenly, people were just running. "There was chaos and pandemonium. There was smoke, I was confused, lost and just wondered what had happened. I had no idea what was going on and it was scary. "All my life I have never heard a bang or boom like that." The second blast killed some of the rescue workers who had rushed to the scene, which was obscured by billows of black smoke. A week later, far away from the city where his parents are based and preparing for his first World Cup with the Super Eagles, Onazi insists the unrest back home has made it difficult to focus on football. "Some will say I should be happy to be alive but I just feel concerned about the security challenges in Jos and Nigeria as a country," he said. "I was born and bred in a peaceful Jos. I may be fortunate enough to live outside the place right now, but I still have my family and friends who live in the city. "I always get worried when there are reports of terrible incidents there on a regular basis. It's sad and depressing to live with this. "Personally, I think there is a need for a holistic approach to solving this problem once and for all. "Innocent people are dying and the government seriously needs to step up security across the country." Another blast happened in Jos days after that incident, in an explosion that targeted football fans watching the European Champions League final, the authorities said. At least three people died and three others were injured in the blast, according to Chris Olakpe, the commissioner of police for Plateau state.